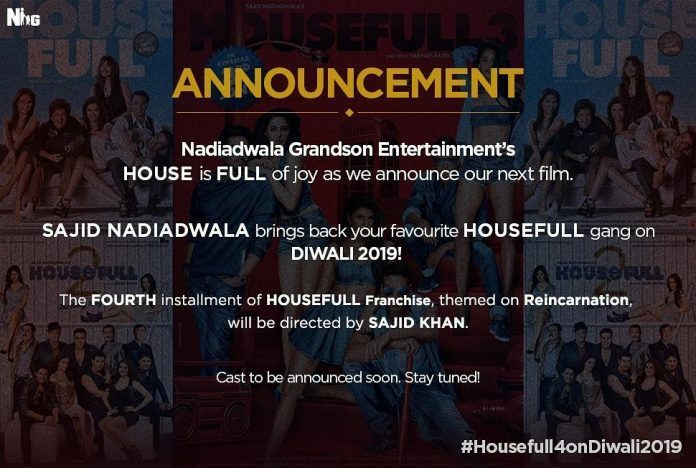 After the success of the fourth installment of the Golmaal series, makers of Housefull franchise have also announced the fourth film. Housefull 3 was a laugh riot and was released in 2016 and proved to be a big hit. The announcement of Housefull 4 was made on the official Twitter page of Nadiadwala Grandson Entertainment. While the earlier film was directed by the director duo Sajid-Farhad, the upcoming installment of the franchise will once again have Sajid Khan on board as the director. The film will be based on reincarnation and is expected to be released during Diwali 2019. While the first two installments of the film got mixed reviews from the audience and critics, the third one was a success. Housefull 3 starred Akshay Kumar, Riteish Deshmukh and Abhishek Bachchan with Jacqueline Fernandez, Lisa Haydon and Nargis Fakhri as the female leads.